our holidays have been different this year. we spent thanksgiving in chicago waiting for our cars' (yes both of them) windows to be repaired (chicago+public lot+downtown+cars filled with stuff+out of state plates+three days sitting =prime break in condition) and then had a grocery store turkey dinner ... a nice grocery store mind you ... but not nearly home cooked. now it seems as though we will be sans home* for christmas as well. this makes the whole gifting situation kinda tricky for us. you see a couple of years ago we decided to forgo the regular wrapped goods and went instead in the direction of baked yumminess from our own kitchen. it works incredibly well especially since our families fall into the category of - we buy everything we want when we want it anyway making it practically impossible to buy for - and very few of them cook at all any more. so the home baked goodness is actually is seemingly perfect ... and it is so.much.fun. for me. we are brainstorming for our boxes this year** and so far we have one not to be missed item. 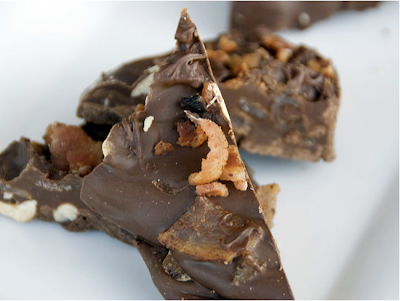 i don't think you will be surprised, and you should be excited, when i tell you that number one on the to bake/make list is chocolate-bacon-peanut bark. yeah, enough said. i know. ** this is entirely dependent upon moving up to a hotel room with a kitchen, which we need, because i am DONE with meat and fried. so sorry to hear that your cars were broken into! that's awful! hope you can get a little more settled before christmas-- and that chocolate concoction looks delish! bacon is neither meat nor fried...it is magic in the form of sustinence.